Compare Cambridge internet plans. Cheapest and fastest broadband. Compare internet plans in Cambridge by clicking here or read on for news of some of the best broadband plans in Cambridge. Last week the NZ Government announced even more improvements to fibre broadband plans in Cambridge and nine other areas. The Local Fibre Company in Cambridge is Ultra Fast Fibre and they will be offering a 1 Gigabit product for residential users on the Ultra-Fast Broadband network come October 1st 2016. These new, faster internet speed plans will mean people can use the internet in ways that were never possible before. This is going to create more innovation and productivity and an even better broadband internet experience for users. The newly announced superfast broadband speeds of 1Gbps (Gigabit per second – the download speed measurement) announced by Enable Fibre in Cambridge are ten times faster than the Government’s benchmark policy product of 100 Mbps from the original UFB tender. Here at Broadband Compare we will keep you up to date on the best broadband plans in Cambridge. Whether you are looking for cheap broadband in Cambridge or you want the fastest broadband plan in Cambridge you will see all the Cambridge broadband plans right here. We have outlined a few of our favourite Cambridge internet plans from a number of different Cambridge internet providers below. Although more Cambridge internet plans will be released soon, one of the first Cambridge internet providers to respond to the change in broadband speed available to residential addresses is MyRepublic. 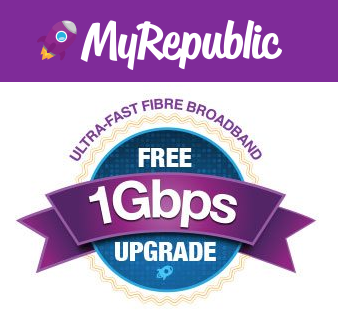 MyRepublic have already released some new Gigabit Cambridge broadband plans and have a great offer if you sign up now including a FREE upgrade to Gigabit speeds as soon as the network capacity is released on October 1st. Details of one of the fastest internet plans in Cambridge are outlined below. • Restore 1 terabyte hard drive in 2.5 hours. Sound good? Sign up to the Cambridge Fibre Gigabit Plan from MyRepublic here. Use Promo Code ‘COMPARE’ for $50 Welcome credit! Not looking to take advantage of the Ultra Fast Broadband Connectivity? Or your landlord won’t allow it? Not a problem… there are still a number of great ADSL broadband plans and VDSL broadband plans available from a number of cheap internet providers in Cambridge. A couple of the cheapest broadband NZ providers are Flip Broadband and Skinny Broadband. Skinny offer what is called a ‘fixed wireless’ broadband solution and is only available in certain areas based on mobile coverage. You can see their plans here. Flip Broadband continually try to position themselves as the cheapest broadband NZ has to offer but there are more cheap internet providers looking to get into the value area of broadband provision and provide cheap broadband in NZ… so by the time we publish this article the cheapest internet NZ has available might well have changed so make sure you compare plans to double check! This plan costs ONLY $54.95 on a 12 month contract – check out the details here. Remember that this plan does cap data consumption at 100Gb a month, so it might be worth looking at some of Flips Cheap unlimited broadband plans too. You can see all their plans here. That’s it for us on the best broadband plans for Cambridge. Remember that plans are always changing so if you are looking to compare broadband plans in Cambridge you might want to double check by inserting your address in the Broadband Compare tool and see all the latest plans for cheap broadband, unlimited broadband and the fastest broadband in Cambridge. Click here to compare Cambridge broadband plans. Choosing your Broadband Speed – what’s the difference? Is this the end of Gigatown?